Times: Rock Tots is on Tuesday and Thursday at 10:30am (Induction starts at 10:15am please come at 10am to fill in a couple of forms). Session finishes at 11.45 am but you can stay longer if you wish to do more climbing in the centre. Prices: The price per session is £6.50 if booking online and £7.50 on the door (1 adult with up to 2 x children age 6 and under). 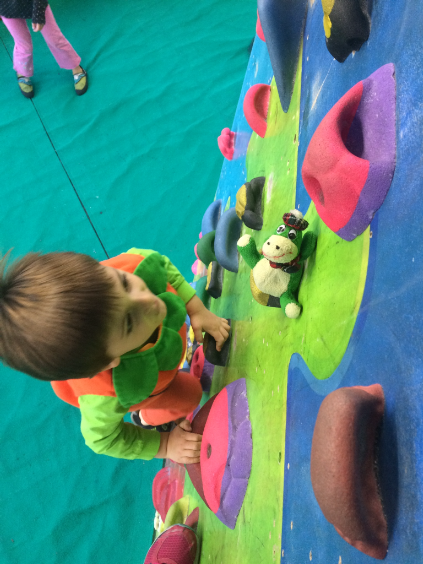 Booking: It is not essential but we are trying to encourage booking onto the sessions so please go to www.climbingworks.com/the-mini-works/rock-tots to save time on the day and ensure a place for your child on that session. Induction: If you are doing the induction, then you might like to call the Climbing Works on 0114 250 9990, as they can take some of your details over the phone which can make the induction process a bit quicker. We love it! … the children are gently encouraged but never pressured. It has helped Robert’s hand eye coordination and he is far more confident than others his age… it has taught Robert safe climbing for the playground. Time and venue: Mondays 1:30-2:45 pm at the Mini Works. Sessions are available during school term time only. Prices: Price per child, per session is £6.50 if booked in advance or £7.50 on the day. You can book online via the Climbing Works website, or by calling The Climbing Works on 0114 250 9990. Cancellation: You may cancel your place at a session by phoning the Climbing Works up to 24-hours prior to the start time (i.e. before 4pm the previous day), if you are unable to attend. Your payment will then be rolled over to another week. We are unable to provide refunds. Supervision: Each supervising adult can supervise a maximum of two children attending the session. to provide refunds.